"The term shinko in the title... was used primarily in Fukagawa, the site of the largest unlicensed entertainment district in Edo, and refers to a girl of around seventeen who has just become a prostitute. 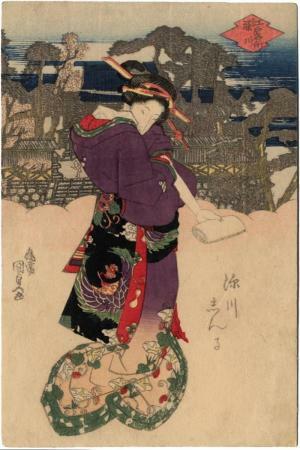 Fukagawa women were known for their simplicity: this beauty wears a robe that is less gaudy than most; the purples fades to pink around the hem and is decorated with morning glories. The obi has a pattern of phoenix roundels. Her hair is modestly decorated with three tortoiseshell combs and pins and one met pin. The shinko's hunched pose (she seems almost deformed) is characteristic of Kunisada's style at this time..."
Quoted from: Kunisada's World by Sebastian Izzard, p. 94. There is an accompanying black and white reproduction on page 95. There is another copy of this print in the Kupferstich-Kabinett, Staatliche Kunstsammlungen, Dresden.